We have heard SHAME yelled a lot lately. Well, I have at least. There are frequent protests in front of office buildings as I am entering or leaving work. I rarely know what they are about since there isn’t much info besides SHAME yelled. Something about corporate greed or animal testing generally. It rarely affects me because I don’t like the word shame. 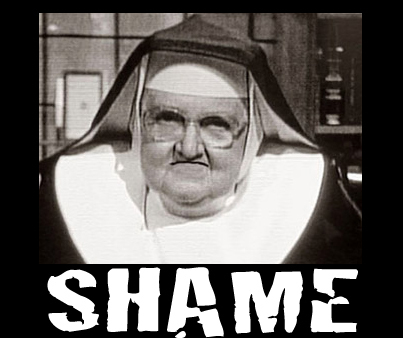 But in the last two days I have seen reasons that shaming should happen more…bear with me. There is a certain amount of respect that comes when you are shamed properly. The first time I thought this was a couple nights ago when I judged two dudes at a ghetto grocery mart I used to frequent. There are very few brand names and very low prices in this brig,ht silent store. After seeing them a couple times as I wandered the aisles for cereal, they were ahead of me in the only open checkout line. One had lots of processed microwave dinners and corn syrup based concoctions of “food”. One had cheese, meat, pasta, vegetables— canned and fresh, some fruits and other ingredients from nature. There was a 2 inch height difference between them and about 150 pound weight difference in the other direction. I was curious so eavesdropped on the prices the cashier called out. $10 difference in favor of the taller, smaller-waisted dude. PROOF for my “fresh food costs the same as ‘cheap’, processed junk in a week’s of groceries” hypothesis. Well, kind of. I was assuming a lot. All the food was for the individual and not sharing. This was for an equal amount of meals or days. Neither had AIDS or cancer which caused weight changes. It was a fact one had all processed and the other fresh was intentional and not just split 51/49 for some massive family/ community life. It lead me to wonder if it was intentional and the food was for each individual, what would happen if they talked about eating better. There would be some shame for the larger dude, but some success and a better life. I know I have lost significant weight by avoiding all fast food and most processed items…and even more when combined with some physical exertion. The second time was this morning. I ran for the MAX and jumped onto an almost empty train. The only other people that got on decided to sit directly in front of me and loudly talk. Loud enough to disturb my single ear bud wearing self. I grabbed the other to limit sounds when I noticed it was cracked in half and not working. So I was stuck with one ear open. One ear to hear things like. “Foo- you call me, why you askin who this is?” or “That $%#$@! told me he ain’t gonna be around when I give birth” or “What it is” to every person that got on the train. The cool thing was the diversity of 4 races in the group of 7 people. Then we got to Lloyd center where I expected the youngish group to get off and bum around the mall area for the day or walk to the nearby high school. Instead one of them embraced a young woman who came on and started smiling. Immediately the entire group changed. Not in a “who are you?” way but instead in a respectful manner. The volume decreased some but I still could hear every word. The woman who entered was a high school teacher. She taught the young man and at least one other person. She also commanded their respect. One of the girls was shamed when she made an inappropriate joke…by her peers. She acted respectful for the rest of the ride. There wasn’t explicit shame in that statement, any more than there was implied respect, but it seemed like the circle of friends he was traveling with could have shamed him in front of his teacher if they hadn’t changed behaviors. And that shame caused him and them to act respectful around the teacher. So maybe an occasional shaming actually grows people.